The Universe is inhomogeneous. Does it matter? Yes! The biggest problem in cosmology—the apparent acceleration of the expansion of the Universe and the nature of dark energy—has stimulated a debate about “backreaction”, namely the effect of inhomogeneities in matter and geometry on the average evolution of the Universe. Our recent paper aims to close a chapter of that debate, to encourage exciting new research in the future. Although matter in the Universe was extremely uniform when the cosmic microwave background radiation formed, since then gravitational instability led to an increasingly complex hierarchy of structures at late epochs—a cosmic web of voids with galaxies and clusters in sheets, filaments and knots. In the standard model of cosmology this hierarchy is treated by assuming an average background universe which expands uniformly, just as if no structures were present. The nonlinear growth of structure is then treated by N-body simulations using Newtonian gravity only. In other words, the background evolution and the evolution of structure do not “talk” to each other, an idealization at odds with the very foundations of general relativity which generically demand a coupling between matter and geometry. The coincidence that the expansion of the Universe appears to have started accelerating at the same epoch when complex nonlinear structures emerged has led a number of researchers to question some basic assumptions of the standard cosmology. In particular, does the growth of structure on scales smaller than 500 million light years result in an average cosmic evolution significantly different from that of a spatially homogeneous and isotropic Friedmann–Lemaître–Robertson–Walker (FLRW) model? After all, this model keeps spatial curvature uniform everywhere and decouples its evolution from that of matter, which is again not a generic consequence of Einstein’s equations. The difference between an averaged generic evolution and an ideal FLRW evolution is usually called backreaction, and is potentially significant for interpreting observations of the actual inhomogeneous Universe—perhaps even to the extent of challenging ideas about cosmic acceleration. With many decades of work built into the standard cosmology, any suggestion that it faces fundamental difficulties is disruptive. Many researchers would embrace a definitive mathematical theorem to rule out significant backreaction of inhomogeneities in cosmology. When Stephen Green and Robert Wald wrote a series of papers claiming to obtain a general result that the contribution of backreaction is unimportant within a mathematically precise framework, some cosmologists assumed the matter settled. In our new paper we critically examine all aspects of the Green–Wald results to show that, in our view, they are not mathematically general. We find that the results are too narrow to capture the essential physical questions of backreaction in cosmology. One key question is: on what scale do Einstein’s equations hold? Many researchers assume that average cosmic evolution must correspond to an exact solution of Einstein’s equations on every scale. The more conservative approach adopted in general backreaction schemes is that the Einstein equations hold only on small scales where they are well tested, and one then finds their effects at larger scales by an averaging or coarse-graining process. This is also conservative compared to numerous research programmes that modify Einstein’s theory of gravity on all scales, often also motivated by the dark energy conundrum. To model cosmic evolution on large scales one has to average or coarse-grain the Einstein equations to capture crucial non-local effects. The dust approximation used for the matter model in cosmology relies on a notion of “particles” whose masses are conserved throughout evolution. As stars, galaxies, clusters, filaments, sheets and voids form one must progressively coarse-grain on larger and larger scales to obtain an effective fluid element with a conserved mass. In general relativity this must ultimately involve the coarse-graining not only of matter, but also of geometry, a nonlinear fitting problem which involves unresolved fundamental physical questions. The averaged cosmic variables in many backreaction schemes are not an exact solution of Einstein’s equations, but rather of equations with additional backreaction terms on any coarse-grained scale. If the actual Universe is described by such equations, then the problem of the nature of dark energy is wide open. Ultimately, any cosmological model must successfully predict observations of the actual Universe. Separately, some of us have produced phenomenological models with backreaction that can be observationally distinguished from the standard FLRW cosmology. Such models are still in their early days. Numerical relativity has the potential to resolve many questions relating to backreaction, and to help us develop better models. Ironically, even though the Einstein equations are 100 years old, it is Newtonian gravity that is still assumed in state-of-the-art numerical cosmology. The general relativistic problem is just extremely difficult; some researchers have tried and given up. Nonetheless, we are encouraged that the first papers to examine backreaction in numerical relativity have now begun to appear, (e.g., arXiv:1511.01105, arXiv:1511.05124). Given the complexities of the problem, debates are likely to continue as understanding grows. Among the issues that will have to be resolved are: (i) How does one consistently excise collapsing regions to numerically coarse-grain over virialized structures that break away from the global expansion? (ii) Should the traditional formalism based on Eulerian perturbations on global spatial hypersurfaces be replaced by Lagrangian methods that have been successfully applied in Newtonian cosmology? (iii) In analytic and phenomenological approaches that some of us are developing, an effective cosmological model should emerge from the coarse-graining process rather than being a priori assumed. How can this be realised numerically? 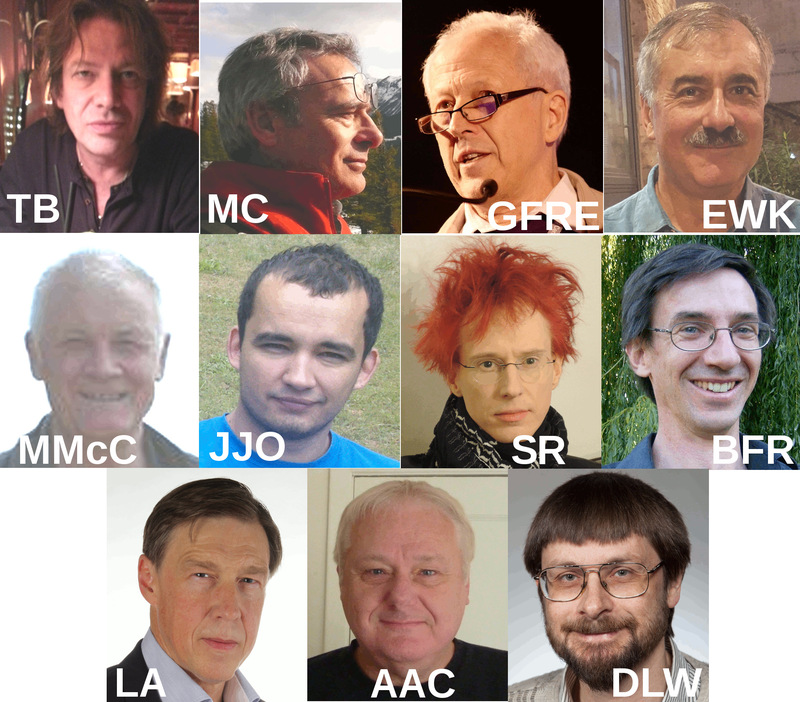 A survey of the eleven authors of our paper would reveal a range of views on the essential physical and mathematical ingredients for a successful cosmological model, or the extent to which one might succeed in accounting for effects usually attributed to dark energy. That is the inevitable state of new science in progress. The problems of cosmological backreaction are so complex that success ultimately needs more than just a few teams working on it. We hope our paper has highlighted the fact that the outcome of such investigations is not a foregone conclusion, so that others might also have the courage to tackle some of the most fundamental unsolved issues in gravitational physics and cosmology. Is there proof that backreaction of inhomogeneities is irrelevant in cosmology? This entry was posted in Author Insights, IOPselect and tagged averaging, backreaction, cosmology by Adam Day. Bookmark the permalink.